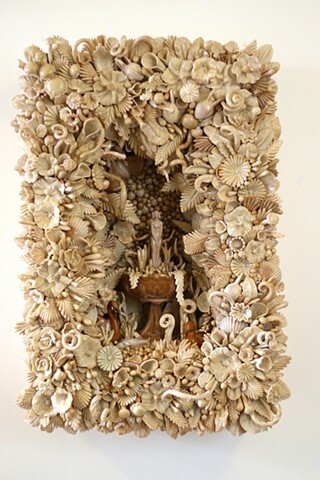 I am very excited that my piece "Grotto of the Chocolate Nymph" is now part of the permanent collection and installed in a new exhibition at The Toledo Museum of Art! 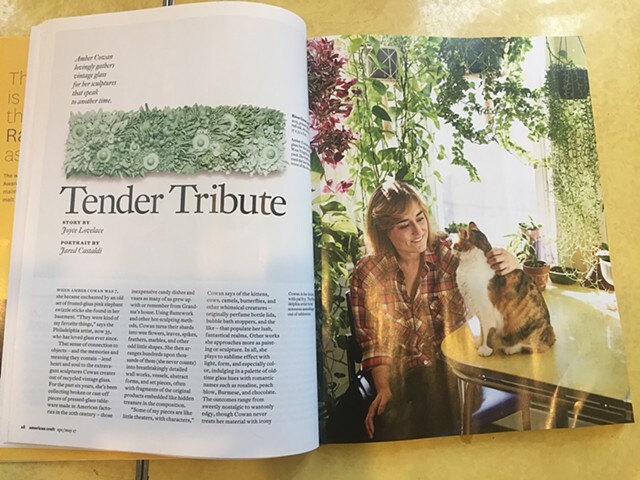 I have a feature article in the April/May issue of American Craft Magazine! I have been reading this magazine since I was a little girl so this is very exciting for me! They even came and took some pics with all my plants and my kitty Ivy! Very excited to be a presenter and demonstrator at this years AUSGlass Conference held in Canberra, Australia this January. Can't wait to go back and see all my favorite Aussies! I will be having my second solo museum exhibition opening this June 24 at The Fuller Craft Museum in Brockton, Mass. Please join me or let me know what you think! I am very excited to say that you can now find my piece "Whole Milk Wash Basin in Colony Harvest" in the collection of The Museum of the Rhode Island School of Design. 21st Century collection. I will be having a show this February through March at Heller Gallery in NYC. This will be the east coast debut of the large scale works made for my show at The Museum of Craft and Design as well as some other new works. The opening is on Thursday Feb 12, from 6-8. The gallery is located in Chelsea at 303 10th Ave. between 27th and 28th st. Hope to see you there! I am so honored and grateful to announce I will be making the 2014 Rakow Commission for The Corning Museum of Glass. The Studio and the Museum have both been such an integral part of my artistic career that this is beyond my wildest dreams. I will be giving a lecture and unveiling the piece on November 13, 2014 at The Corning Museum of Glass. This is a wonderful article written by Andrew Page with an interview of Tina Oldknow, Curator of Modern Glass at Corning. I am so excited to announce that I will be having a solo exhibition at The Museum of Craft and Design in San Francisco! The dates of the show will be October 18, 2014-January 4, 2015. The Shanghai Museum of Glass has acquired one of my Rosaline pieces for their permanent collection. If you are ever in Shanghai (Lucky you), go check out the museum and spot my work.. I am very excited to be a part of the upcoming exhibition at The New Britain Museum of American Art, Glass Today: 21st Century Innovations. The exhibition will feature an incredible line-up and diversity of artists creating work with glass. June 21-Sept 21. I will be attending the opening reception on Sunday June 22nd. I will be having a piece in the February |Supercool Glass| Exhibition at The Shelburne Museum in Vermont. The show is pairing historic pieces in the collection with contemporary artists. I am really excited about their milk glass collection and am working on a new milk glass piece for the show. I am so happy to be included in The Chinese International Contemporary Glass Art Exhibition taking place this January at The China Academy of Art in Hangzhou. The exhibition will include Chinese glass artists as well as international artists: Dan Clayman, Richard Whiteley, Nadege Desgenetez, Klaus Moje, Heike Brachlow and Nick Mount. We have been invited to a symposium that will take place January 14th where I will be giving a presentation on my work. I have never been to China!! I am excited to announce my participation in a group exhibition to celebrate the 50th anniversary of the Hempel Glass Museum in Denmark in 2015. The exhibition will take place from March-October of 2015 and include 8-10 International artists working in glass. I am very excited to be a part of this years Art Miami Fair. My work will be exhibited with Heller Gallery, NYC. Not sure if I am going as of yet but I am having sunny visions. I will be making my second appearance at the 2013 SOFA Chicago show with Heller Gallery. I'm working on some new exciting pieces for the show. Please come say hi! Opening night is Halloween October 31 (scary but true). I am so excited to announce that I will be teaching a class in late June at The Studio of the Corning Museum of Glass as well as a week long class in September 2014 at The Pilchuck Glass School. I love both of these schools and to be able to teach at such prestigious institutions for glassmaking is an absolute dream come true. I am extremely honored to be selected as one of the 2013 "Rising Stars" at GlassWeekend at Wheaton Arts. I was chosen to represent the Philadelphia area by the Contemporary Glass Philadelphia organization. Eight artists were chosen throughout the US. I will be giving a short lecture about my work and I will also have my work represented at the show by Heller Gallery. This should be a really phenomenal weekend with demonstrations and lectures by Beth Lipman, Davide Salvadore, Hiroshi Yamano, and Judith Schaechter. My solo exhibition Reconstructions is currently up at Heller Gallery in New York City March 8th-April 6. My main piece in the show is a large wall installation based around the story of The Morgan Vase, a Chinese porcelain vase that sold at a famous auction in 1886 for $18,000, sparking controversy and fads of the Peach Blow color scheme to spread across the nation. I will also have a number of pieces from my Colony Harvest series as well as a showing of my pieces Basket and Spike. The opening will take place on Saturday March 9, from 6-8 pm. Would love to see you there! I am very excited to be included in the show Twenty-First Century Heirlooms at The Racine Art Museum opening this April. The notion of an heirloom often describes objects “passed down” to family and friends. It suggests an intimate connection or—at a minimum—a relationship between something past and something present (and, hopefully, something future). This exhibition will use the work of contemporary artists to investigate heirlooms as ideas—as links between generations and communities, as concepts to modify or embellish, as techniques to master or modify, and as objects to treasure or refuse. Featuring artists at various phases in their careers and objects crafted from a variety of different media, Twenty-First Century Heirlooms is a large-scale exhibition that offers a context for exploring what we value today and why. From brooches that use famous Western paintings as reference points to sculptures made of accumulations of recycled twentieth-century pressed glass, as well as fast food containers made of silver, the work included in this show expands and challenges how we define heirlooms in the twenty-first century. With its New York City premiere at MAD, the documentary, The Toledo Workshop Revisited, offers a rare insight into the creative process of three emerging glass artists, Amber Cowan, Kim Harty and Matt Szosz. The filmtraces their process from initial ideas through discovery (and occasional frustration) to their final project. During a one week residency at the Toledo Museum of Art, The Toledo Workshop Revisited follows the artists as they experiment with replicas of the glass and furnace used 50 years ago in Harvey Littleton’s historic glass workshop, which opened the way for artists to use glass as a sculptural material. Directly following the film, curator Jennifer Scanlan will lead a discussion with the artists and filmmakers about their work. Culminating the evening, Heller Gallery will host a reception at their Chelsea location, in which work by the featured artists will be on display. I am very excited to be included in a four person group exhibition at the Wexler Gallery in Philadelphia this March. Wexler Gallery will feature New Visions, an exhibition of dynamic sculptural works in glass, metal, and mixed media by Philadelphia based artists Jen Blazina, Amber Cowan, Joanna Manousis, and Stacey Lee Webber. The show will run March 1- April 27, 2013. An Opening Reception will take place First Friday, March 1st from5 – 8pm. I will be making my first appearance at SOFA Chicago this November with the Heller Gallery. This is very exciting. And stay tuned for my show with them in March. I am currently working on an enormous wall installation for this show along with many other pieces. I will also be doing a demo at some point during the SOFA weekend on the Corning Roadshow mobile glassblowing stage. Hmmm what shall I make?! One of my pieces has been selected by Temple University to be given to journalist Anderson Cooper as this years Lew Klein "Excellence in Media" award. The piece selected is the "Bottle Bowl" that I made out of recycled wine bottles during my fellowship at The Australian National University. Thank you to the Inhabit website for posting a lovely little write up about my work. Inhabitat, your online guide to the best green design ideas, innovations and inspiration to build a cleaner, brighter, and better future. I will be in Australia this summer from June 26th through August 22. I will be doing work at The Glass Workshop of The Australian National University as The 2012 International Procter Fellow. I have big plans for work I will be making with a lot of experimentation. Yes, that is the plan.....and hopefully seeing a kangaroo. I am completely humbled by my inclusion as one of three artists chosen to participate in The Toledo Workshop Revisited. This March," the Toledo Museum of Art will commemorate the 50th anniversary of Harvey Littleton's seminal 1962 Toledo Workshop by offering three artists the opportunity to realize a contemporary project using a furnace modeled after the one that Littleton and Dominick Labino developed 50 years ago. It was this small-scale furnace design that made the Studio Glass movement possible." "To honor the past and celebrate the future of glass, selected members of a new generation of artists who directly experiment with the material in their own way will be chosen for this project. It was direct experimentation with the material that drove Harvey Littleton's quest to make glass available to artists working in a studio setting.The residents will begin by participating in the building of a 1962 style furnace." Stay tuned for more information on the project I will attempt at the workshop. I am so excited to work and share with the other two selected artists Kim Harty and Matthew Szosz. WOW!! My piece Basket has been given The Tyler Alumni Association Award of Excellence at the Outside/Inside the Box show for Fiber Philadelphia 2012. I am a total advocate for Tyler School of Art, my alma mater, and really believe I would not be on the same path if it was not for my graduate education there. Outside/Inside the Box showcases innovative fiber/textile art that transcends disciplines and combines historic concepts with contemporary perspectives. This juried exhibition represents 68 artists working in media with fiber/textile reference. 516 artists from 15 countries applied with 1,316 pieces of work. Countries represented are Argentina, Australia, Belgium, Canada, Chile, Denmark, France, Germany, Hungary, Iceland, Sweden,Switzerland, Turkey, United Kingdom, and the United States. Elisabeth R. Agro is the Nancy M. McNeil Associate Curator of American Modern, Contemporary Crafts and Decorative Arts at the Philadelphia Museum of Art. Bruce D. Hoffman is the curatorial consultant for Outside/Inside the Box and FiberPhiladelphia 2012. An independent curator, Hoffman lectures on the decorative arts with a focus on contemporary textile and fiber art. The former Director of the Snyderman-Works Gallery, Bruce Hoffman was instrumental in creating the International Fiber Biennial. Judith Weisman lectures, curates, juries, and designs exhibitions in the field of contemporary decorative arts. Her projects have been widely published. She served on the Board of Trustees of the American Craft Council and is Acquisitions Chair of the Smithsonian's Renwick Gallery support group. I am so incredibly honored to be the recipient of The 2012 Stephen Procter Fellowship at The Glass Workshop of Australia National University. I will be traveling to Canberra this July and August to make work using local recycled glass that I will flamework and hot-sculpt into compositions and installations. I am so excited to spend time exchanging information with the distinguished faculty and students of ANU. I had a wonderful and unexpected write-up about my work in The Daily Art Muse Blog. Thank you to Susan Lomuto. I am totally psyched to be the teaching assistant at Penland this summer for Andre Gutgesell during session 1. Andre is a master flameworker from Lauscha. He is using all soft glass rod and tubing to create amazing pieces of work. If anyone has ever attempted to use soft glass tubing you understand why Andre is the man. A version of my piece Milk can now be found at The PISMO Gallery in Denver Colorado. This is a 7 piece installation. On March 18th I will be the moderator for the "Ask the Experts" panel discussion at The International Flameworking Conference held at Salem Community College. The panel includes four distinguished and knowledgeable members of the glass community: Paul Stankard, Milon Townsend, Sally Prasch, and Andrew Page. These four panelists cover a huge basis of expertise on a variety of glass inquisitions. I am collecting questions to ask the panelists. Please email me with any possible question and I will try to include it in the panel as well as relay you the answer. My piece Basket will be displayed at the Outside/Inside the Box show for the Philadelphia Fibers Biennial March 1st through April 15th. This exciting show is bringing together artist who work in a variety or mediums and will be show at The Crane Arts Building, 1400 N. American St. Philadelphia. Receptions Saturday March 3 and 31st, 5-8pm. My piece Basket will be featured in this yearly magazine showing 100 new glass works. I am incredibly excited to be the TA for the upcoming Lucio Bubacco and Paul Stankard class at Corning this winter. It is session 3 in January. Not only is this going to be a killer class but my good friends Jessica Jane Julius and Erica Rosenfeld will be teaching a class in the hotshop next door. So awesome. I highly recommend Corning for all your educational glass needs. The studio and staff are top notch. After a long summer away I am very excited to be back in Philly for an exciting fall season. This semester I am very honored to be co-teaching a class with Paul Stankard at Salem Community College. Also, I will be teaching an Intro/Intermediate class at Tyler School of Art as well as be the artist in residence at the studio for the semester. Salem has also asked me to be on the board of the 2012 International Flameworking Conference held this March in Carney's Point, New Jersey. So, if anyone reading this has any ideas for the conference please let me know and I will be sure to pass them along. I will be the teaching assistant in the flameshop this summer for Gianni Toso at The Studio of The Corning Museum of Glass. This is the third class I will be TA'ing for Gianni at Corning and I know from experience it will be an amazing, exciting, and hilarious two weeks. Bill Gudenrath will also be teaching session 7 in the hot shop which will make for excellent times. Yay Glass Camp! Oh! Also, Corning did a live stream video of one of Gianni's demos which can now be found in the video archives. I tried to stay off camera as much as possible but you can see him making me crack up at one point, as usual. Come to my MFA Thesis Show! See what I have been up to the past two years. April 8th 6-9pm. Temple Gallery, Tyler School of Art. I was the featured artist in The New Jersey Sunbeams article on The 2011 International Flameworking Conference! I am very honored to be giving a lecture and demonstration at this years International Flameworking Conference at Salem Community College. March 18-20. My lecture will be at 1:00 Sunday. I will be speaking about my work and path to graduate school as well as the research I am doing on the diversity of flameshops in the university system. I will also focus on the potential of recycled glass for flameworking, specifically Fenton cullet. My demonstration will be on flameworking recycled Fenton glass. I got a great blog review for the show this past weekend for the CAA conference MFA exhibition at the Hunter College Times Square Gallery. There were 20 participating schools within 100 miles of NYC each with their own gallery. I will have a piece included in the Ice Box show at the Crane Arts building March 2nd through 13th. First Friday March 2nd opening, 6-9 pm. Second Thursday opening March 10th, 6-9pm. All of the second-year grads at Tyler will have a piece in the show.